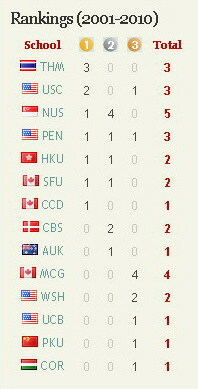 <?xml:namespace prefix = st1 ns = "urn:schemas-microsoft-com:office:smarttags" />Thammasat University claims the top spot, while Hong Kong University of Science and Technology (HKUST) and the University of Pennsylvania (The Wharton School) win second and third place trophies, respectively. Jiraya Boonyasait, Kattareeya Teeraratpol, Vorawan Wangpanitkul and Monsinee Sattayarak made up the Thammasat delegation. They were coached by advisor Satjaporn Tungsong. The winning team has overcome an unwritten odd at this case competition. In recent years, none of the teams selected to present first were able to make it to the top 3. Until now. Despite being chosen as team number one and facing the pressure of presenting first, Thammasat delivered a solid strategy which set the tone for an intense day of competition. In the end, they remained undefeated and took the champions� plate home. Posted date: March 29, 2010 � 16:10 hrs.